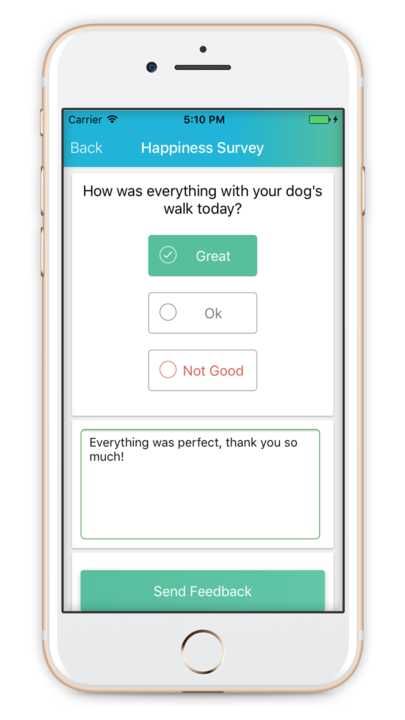 The Happiness Score in Time To Pet gives pet care companies an easy way to gather feedback from their clients. 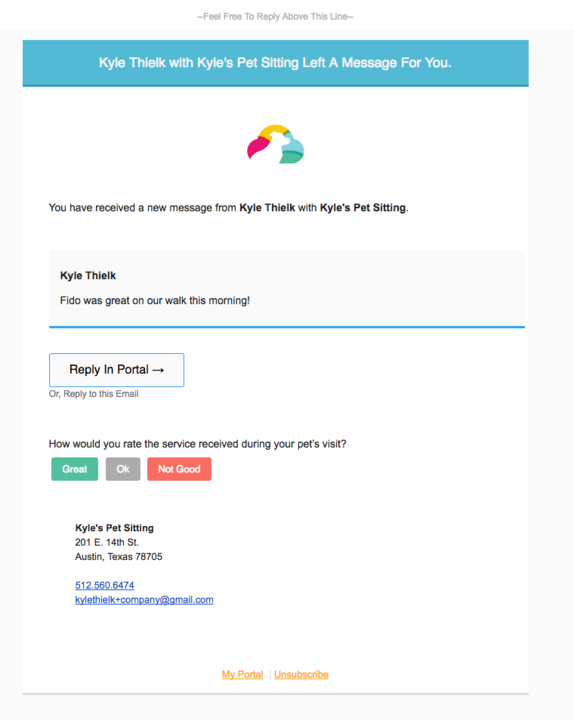 When enabled, each post visit report (this is the message triggered after completing a visit) that is sent to a client via email or via the Time To Pet Client App will include a link for the client to submit their feedback (this link is not available on post visit reports that are sent via text message). The client can choose a positive reaction, a neutral reaction or a negative reaction. 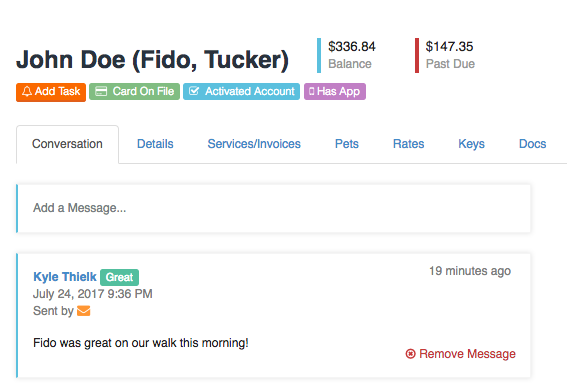 After choosing their reaction, the client can also leave comments for the pet care company. You can also see reports for the Happiness Score for your company. The score is based on a scale of 0 to 100. The Happiness Score formula gives 100% of the total possible points for a positive rating, 50% for a neutral rating and 0% for a poor rating. You can also run reports based on periods of time and reports based on specific staff members. For example, if a staff member has 10 ratings and all 10 are positive, their Happiness Score will be 100%. If 5 are positive ratings and 5 are negative ratings, their Happiness Score will be 50%. If all 10 ratings are poor, their Happiness Score will be 0%. The Happiness Score can be used several different ways for your business. It can be used to help keep your finger on the pulse of your customer satisfaction. It can be used to determine which staff members go above and beyond for your clients. Or it can also be used to determine which clients may be great candidates to write a review for your business. Let's now explore how to enable the Happiness Score for your business. You can find the settings section for your Happiness Score in Advanced Settings under " Happiness". From here, you can enable the Happiness Score Surveys. 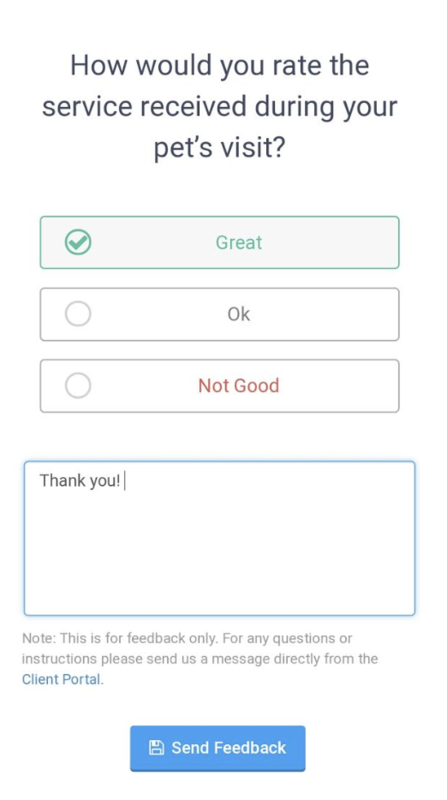 You can also customize the survey question that is asked as well as the text for a positive, neutral, and negative reaction. By default, the question is set to "How would you rate the service received during your pet's visit?" The reactions are defaulted to "Great", "Ok", and "Not Good". 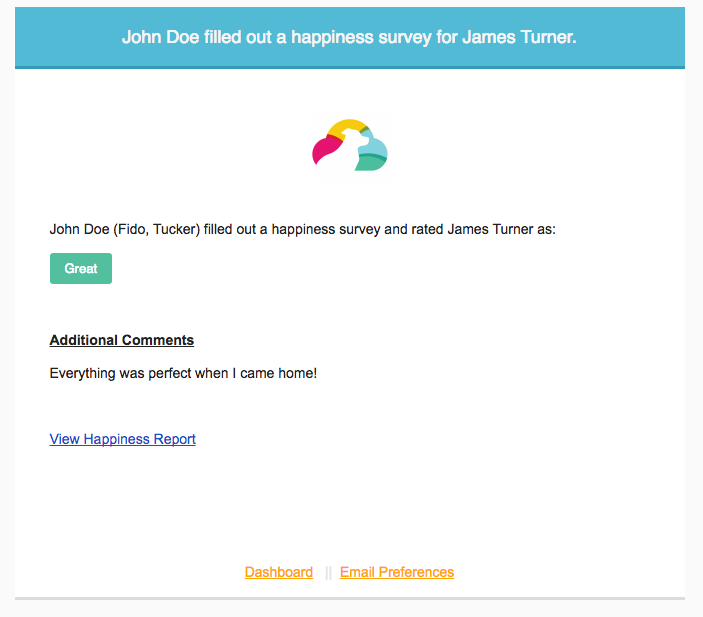 After enabling the Happiness Score feature, clients will be able to give feedback on their services. All post visit reports (this is the message triggered after completing a visit) that are delivered via email and/or in the Client App will have a link for your client to submit their feedback. Happiness Score surveys are not available for messages sent via text message. The post visit report email will include your survey question and buttons for a positive, neutral, and negative reaction. These buttons are also color coded with green meaning positive, gray meaning neutral, and red meaning a negative reaction. After selecting their reaction, the client will be taken to a new webpage where they can include comments and submit their feedback. Their selection will be automatically checked based on what reaction they clicked in the email but they can change their reaction choice on this screen as well. 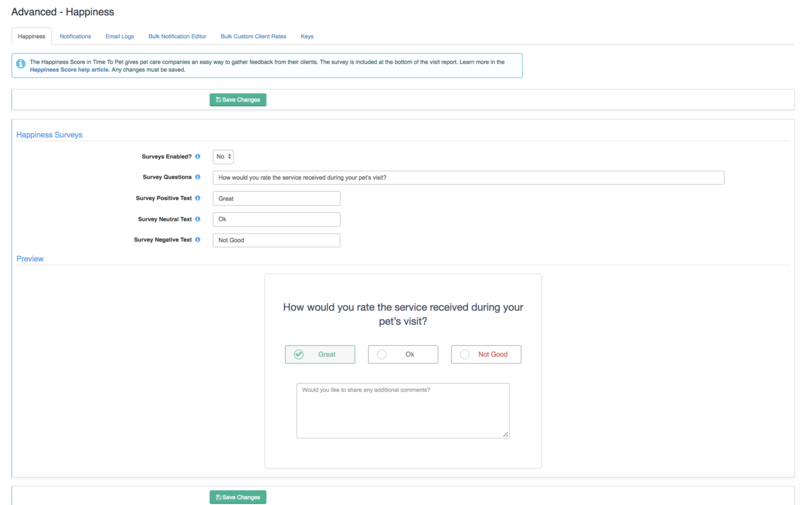 The client will also see a note that lets them know the survey is for feedback only, and guides them to send any additional messages through the Client Portal. Clients can also submit feedback directly from their Client App in the Conversation Feed. On messages that are triggered from completing event (and feedback for that visit has not already been given), clients can select the link for "How did we do?" to submit their feedback. They can then select their reaction, provide any additional comments and submit their feedback. When a client submits a Happiness Survey, Time To Pet will email the admin team and let them know. 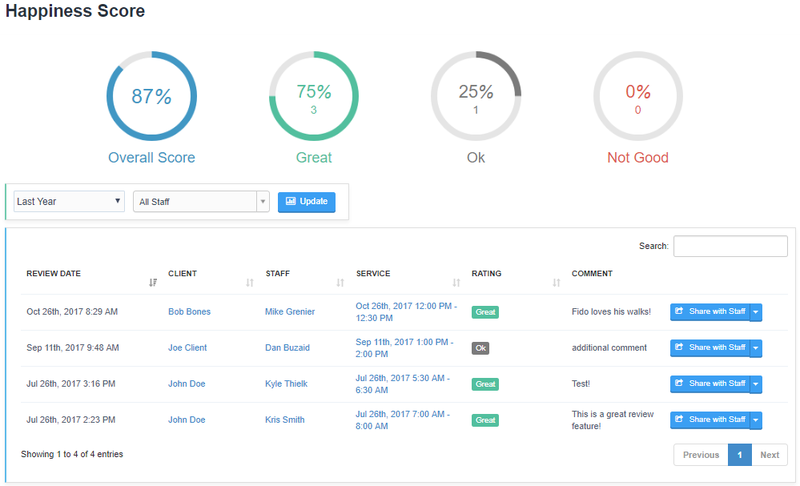 An admin can also see the rating in the client's conversation feed attached to the message sent from the staff member. A few additional notes: The Happiness Score Report is only visible to admin and office managers that have the ability to manage staff permissions. 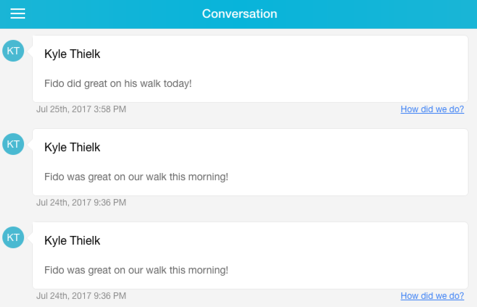 Individual Happiness Scores and client comments can optionally be shared with the staff member assigned to that event by clicking the "Share with Staff" button. In order to avoid recency bias, clients do not have access to their historical ratings either. All data for the Happiness Score can be found under the Staff or Users section on the left sidebar under the Happiness section. By default, Time To Pet will show you the Happiness Score for your entire company. This is the aggregate of all ratings submitted by your clients. You can also filter this data by a date range or by staff member. The Overall Score is determined by the percentage of positive, neutral, and negative reactions submitted. Each positive score adds 100% of the total possible points to the Overall Score. A neutral reactions adds 50% of the possible points. A negative reaction adds 0% of the possible points. An Overall Score of 100% means there are all positive ratings. An Overall Score of 0% means there are all negative ratings. Every so often, you may get a Happiness Score that seems a little off. Maybe your client clicked the wrong button or had a bad day and wasn't nearly as upset as they seemed. You can remove a Happiness Score by clicking the dropdown next to the score you want to remove.